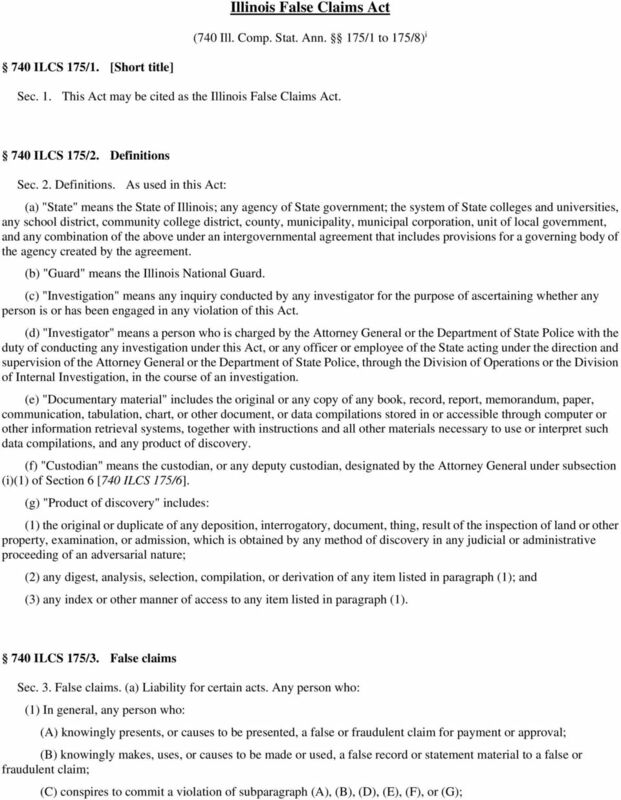 Download "Illinois False Claims Act"
3 Sec. 4. Civil actions for false claims. 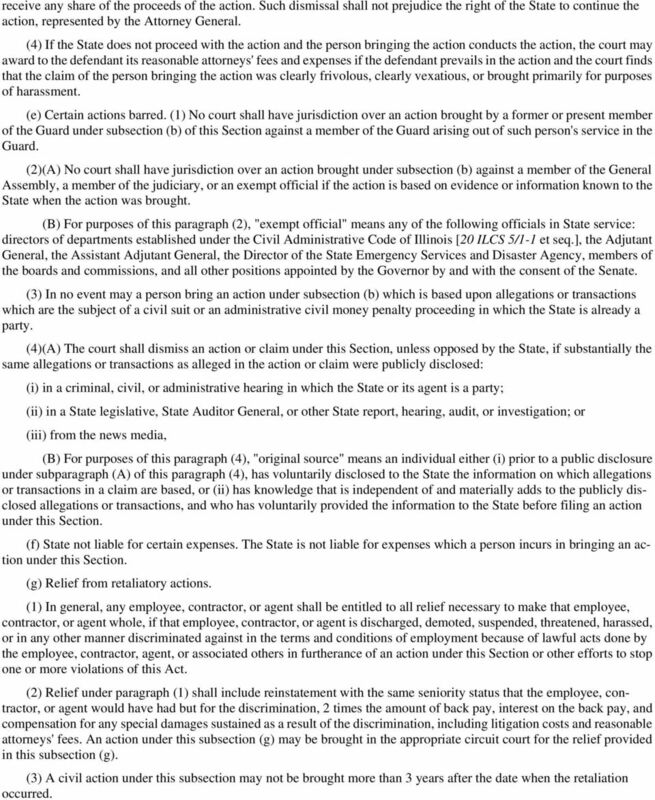 (a) Responsibilities of the Attorney General and the Department of State Police. The Attorney General or the Department of State Police shall diligently investigate a civil violation under Section 3 [740 ILCS 175/3]. If the Attorney General finds that a person violated or is violating Section 3, the Attorney General may bring a civil action under this Section against the person. The State shall receive an amount for reasonable expenses that the court finds to have been necessarily incurred by the Attorney General, including reasonable attorneys' fees and costs. All such expenses, fees, and costs shall be awarded against the defendant. The court may award amounts from the proceeds of an action or settlement that it considers appropriate to any governmental entity or program that has been adversely affected by a defendant. The Attorney General, if necessary, shall direct the State Treasurer to make a disbursement of funds as provided in court orders or settlement agreements. (b) Actions by private persons. (1) A person may bring a civil action for a violation of Section 3 for the person and for the State. The action shall be brought in the name of the State. The action may be dismissed only if the court and the Attorney General give written consent to the dismissal and their reasons for consenting. (2) A copy of the complaint and written disclosure of substantially all material evidence and information the person possesses shall be served on the State. The complaint shall be filed in camera, shall remain under seal for at least 60 days, and shall not be served on the defendant until the court so orders. The State may elect to intervene and proceed with the action within 60 days after it receives both the complaint and the material evidence and information. (3) The State may, for good cause shown, move the court for extensions of the time during which the complaint remains under seal under paragraph (2). Any such motions may be supported by affidavits or other submissions in camera. The defendant shall not be required to respond to any complaint filed under this Section until 20 days after the complaint is unsealed and served upon the defendant. (4) Before the expiration of the 60-day period or any extensions obtained under paragraph (3), the State shall: (A) proceed with the action, in which case the action shall be conducted by the State; or (B) notify the court that it declines to take over the action, in which case the person bringing the action shall have the right to conduct the action. (5) When a person brings an action under this subsection (b), no person other than the State may intervene or bring a related action based on the facts underlying the pending action. (c) Rights of the parties to Qui Tam actions. (1) If the State proceeds with the action, it shall have the primary responsibility for prosecuting the action, and shall not be bound by an act of the person bringing the action. Such person shall have the right to continue as a party to the action, subject to the limitations set forth in paragraph (2). (2)(A) The State may dismiss the action notwithstanding the objections of the person initiating the action if the person has been notified by the State of the filing of the motion and the court has provided the person with an opportunity for a hearing on the motion. (B) The State may settle the action with the defendant notwithstanding the objections of the person initiating the action if the court determines, after a hearing, that the proposed settlement is fair, adequate, and reasonable under all the circumstances. Upon a showing of good cause, such hearing may be held in camera. (C) Upon a showing by the State that unrestricted participation during the course of the litigation by the person initiating the action would interfere with or unduly delay the State's prosecution of the case, or would be repetitious, irrelevant, or for purposes of harassment, the court may, in its discretion, impose limitations on the person's participation, such as: (i) limiting the number of witnesses the person may call: (ii) limiting the length of the testimony of such witnesses; (iii) limiting the person's cross-examination of witnesses; or (iv) otherwise limiting the participation by the person in the litigation. 5 receive any share of the proceeds of the action. Such dismissal shall not prejudice the right of the State to continue the action, represented by the Attorney General. 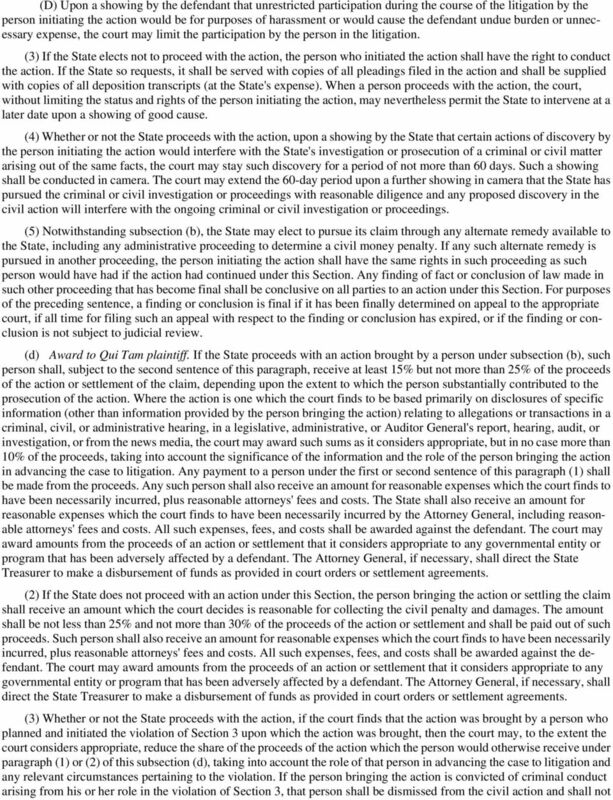 (4) If the State does not proceed with the action and the person bringing the action conducts the action, the court may award to the defendant its reasonable attorneys' fees and expenses if the defendant prevails in the action and the court finds that the claim of the person bringing the action was clearly frivolous, clearly vexatious, or brought primarily for purposes of harassment. (e) Certain actions barred. (1) No court shall have jurisdiction over an action brought by a former or present member of the Guard under subsection (b) of this Section against a member of the Guard arising out of such person's service in the Guard. (2)(A) No court shall have jurisdiction over an action brought under subsection (b) against a member of the General Assembly, a member of the judiciary, or an exempt official if the action is based on evidence or information known to the State when the action was brought. (B) For purposes of this paragraph (2), "exempt official" means any of the following officials in State service: directors of departments established under the Civil Administrative Code of Illinois [20 ILCS 5/1-1 et seq. ], the Adjutant General, the Assistant Adjutant General, the Director of the State Emergency Services and Disaster Agency, members of the boards and commissions, and all other positions appointed by the Governor by and with the consent of the Senate. (3) In no event may a person bring an action under subsection (b) which is based upon allegations or transactions which are the subject of a civil suit or an administrative civil money penalty proceeding in which the State is already a party. 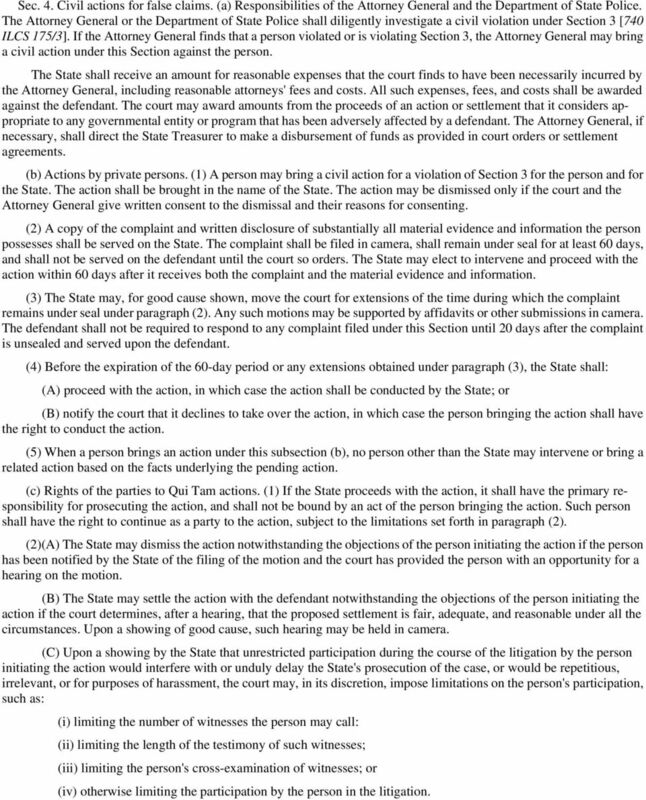 (4)(A) The court shall dismiss an action or claim under this Section, unless opposed by the State, if substantially the same allegations or transactions as alleged in the action or claim were publicly disclosed: (i) in a criminal, civil, or administrative hearing in which the State or its agent is a party; (ii) in a State legislative, State Auditor General, or other State report, hearing, audit, or investigation; or (iii) from the news media, (B) For purposes of this paragraph (4), "original source" means an individual either (i) prior to a public disclosure under subparagraph (A) of this paragraph (4), has voluntarily disclosed to the State the information on which allegations or transactions in a claim are based, or (ii) has knowledge that is independent of and materially adds to the publicly disclosed allegations or transactions, and who has voluntarily provided the information to the State before filing an action under this Section. (f) State not liable for certain expenses. The State is not liable for expenses which a person incurs in bringing an action under this Section. (g) Relief from retaliatory actions. (1) In general, any employee, contractor, or agent shall be entitled to all relief necessary to make that employee, contractor, or agent whole, if that employee, contractor, or agent is discharged, demoted, suspended, threatened, harassed, or in any other manner discriminated against in the terms and conditions of employment because of lawful acts done by the employee, contractor, agent, or associated others in furtherance of an action under this Section or other efforts to stop one or more violations of this Act. (2) Relief under paragraph (1) shall include reinstatement with the same seniority status that the employee, contractor, or agent would have had but for the discrimination, 2 times the amount of back pay, interest on the back pay, and compensation for any special damages sustained as a result of the discrimination, including litigation costs and reasonable attorneys' fees. An action under this subsection (g) may be brought in the appropriate circuit court for the relief provided in this subsection (g). (3) A civil action under this subsection may not be brought more than 3 years after the date when the retaliation occurred. 6 740 ILCS 175/5. False claims procedure Sec. 5. False claims procedure. (a) A subpoena requiring the attendance of a witness at a trial or hearing conducted under Section 4 of this Act [740 ILCS 175/4] may be served at any place in the State. (b) A civil action under Section 4 may not be brought: (1) more than 6 years after the date on which the violation of Section 3 [740 ILCS 175/3] is committed, or (2) more than 3 years after the date when facts material to the right of action are known or reasonably should have been known by the official of the State charged with responsibility to act in the circumstances, but in no event more than 10 years after the date on which the violation is committed, whichever occurs last. 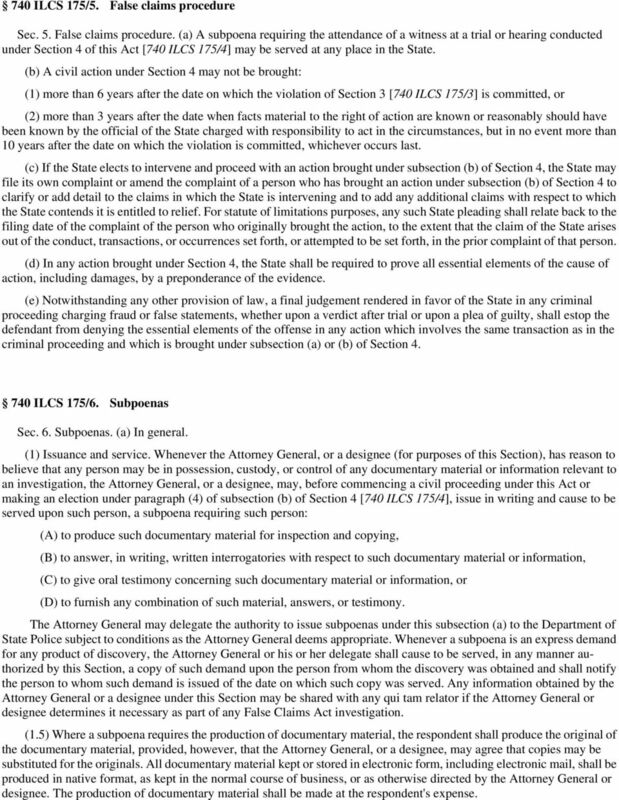 (c) If the State elects to intervene and proceed with an action brought under subsection (b) of Section 4, the State may file its own complaint or amend the complaint of a person who has brought an action under subsection (b) of Section 4 to clarify or add detail to the claims in which the State is intervening and to add any additional claims with respect to which the State contends it is entitled to relief. For statute of limitations purposes, any such State pleading shall relate back to the filing date of the complaint of the person who originally brought the action, to the extent that the claim of the State arises out of the conduct, transactions, or occurrences set forth, or attempted to be set forth, in the prior complaint of that person. (d) In any action brought under Section 4, the State shall be required to prove all essential elements of the cause of action, including damages, by a preponderance of the evidence. (e) Notwithstanding any other provision of law, a final judgement rendered in favor of the State in any criminal proceeding charging fraud or false statements, whether upon a verdict after trial or upon a plea of guilty, shall estop the defendant from denying the essential elements of the offense in any action which involves the same transaction as in the criminal proceeding and which is brought under subsection (a) or (b) of Section ILCS 175/6. Subpoenas Sec. 6. Subpoenas. (a) In general. (1) Issuance and service. 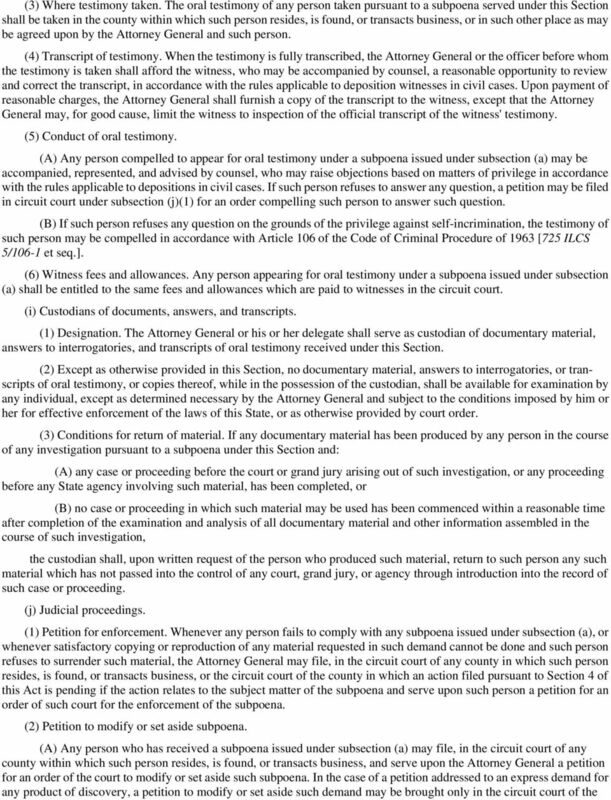 Whenever the Attorney General, or a designee (for purposes of this Section), has reason to believe that any person may be in possession, custody, or control of any documentary material or information relevant to an investigation, the Attorney General, or a designee, may, before commencing a civil proceeding under this Act or making an election under paragraph (4) of subsection (b) of Section 4 [740 ILCS 175/4], issue in writing and cause to be served upon such person, a subpoena requiring such person: (A) to produce such documentary material for inspection and copying, (B) to answer, in writing, written interrogatories with respect to such documentary material or information, (C) to give oral testimony concerning such documentary material or information, or (D) to furnish any combination of such material, answers, or testimony. The Attorney General may delegate the authority to issue subpoenas under this subsection (a) to the Department of State Police subject to conditions as the Attorney General deems appropriate. Whenever a subpoena is an express demand for any product of discovery, the Attorney General or his or her delegate shall cause to be served, in any manner authorized by this Section, a copy of such demand upon the person from whom the discovery was obtained and shall notify the person to whom such demand is issued of the date on which such copy was served. Any information obtained by the Attorney General or a designee under this Section may be shared with any qui tam relator if the Attorney General or designee determines it necessary as part of any False Claims Act investigation. (1.5) Where a subpoena requires the production of documentary material, the respondent shall produce the original of the documentary material, provided, however, that the Attorney General, or a designee, may agree that copies may be substituted for the originals. All documentary material kept or stored in electronic form, including electronic mail, shall be produced in native format, as kept in the normal course of business, or as otherwise directed by the Attorney General or designee. The production of documentary material shall be made at the respondent's expense. 8 (B) depositing an executed copy of such subpoena or petition in the United States mails by registered or certified mail, with a return receipt requested, addressed to the person at the person's residence or principal office or place of business. (e) Proof of service. A verified return by the individual serving any subpoena issued under subsection (a) or any petition filed under subsection (j) setting forth the manner of such service shall be proof of such service. In the case of service by registered or certified mail, such return shall be accompanied by the return post office receipt of delivery of such subpoena. (f) Documentary material. (1) Sworn certificates. 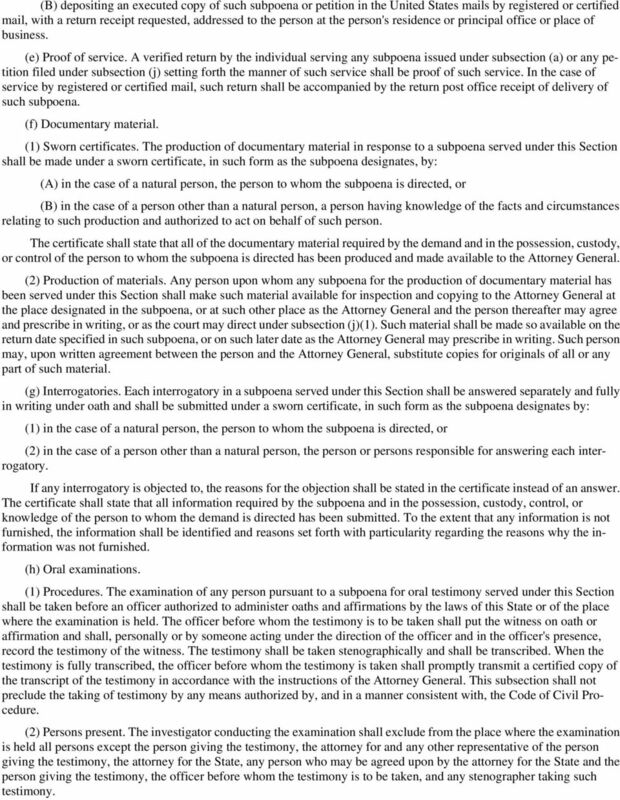 The production of documentary material in response to a subpoena served under this Section shall be made under a sworn certificate, in such form as the subpoena designates, by: (A) in the case of a natural person, the person to whom the subpoena is directed, or (B) in the case of a person other than a natural person, a person having knowledge of the facts and circumstances relating to such production and authorized to act on behalf of such person. The certificate shall state that all of the documentary material required by the demand and in the possession, custody, or control of the person to whom the subpoena is directed has been produced and made available to the Attorney General. (2) Production of materials. 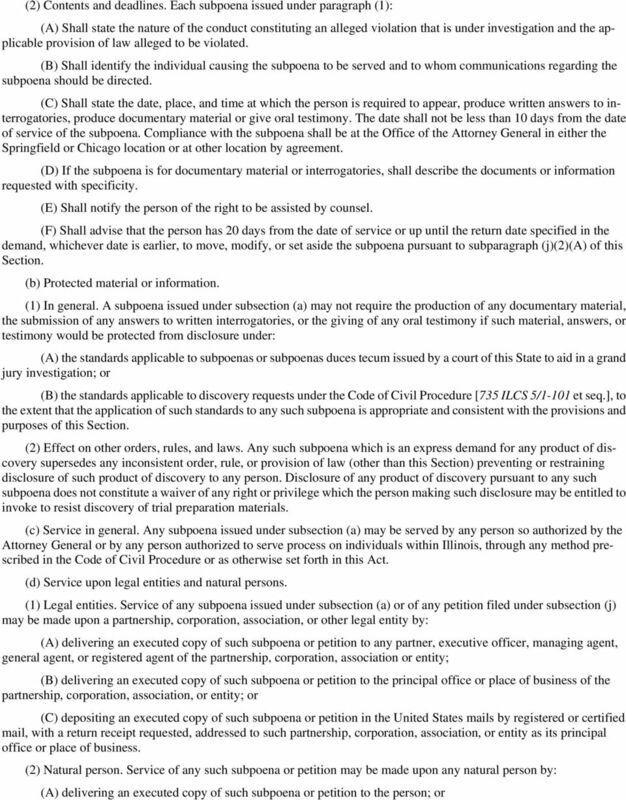 Any person upon whom any subpoena for the production of documentary material has been served under this Section shall make such material available for inspection and copying to the Attorney General at the place designated in the subpoena, or at such other place as the Attorney General and the person thereafter may agree and prescribe in writing, or as the court may direct under subsection (j)(1). Such material shall be made so available on the return date specified in such subpoena, or on such later date as the Attorney General may prescribe in writing. Such person may, upon written agreement between the person and the Attorney General, substitute copies for originals of all or any part of such material. (g) Interrogatories. Each interrogatory in a subpoena served under this Section shall be answered separately and fully in writing under oath and shall be submitted under a sworn certificate, in such form as the subpoena designates by: (1) in the case of a natural person, the person to whom the subpoena is directed, or (2) in the case of a person other than a natural person, the person or persons responsible for answering each interrogatory. If any interrogatory is objected to, the reasons for the objection shall be stated in the certificate instead of an answer. The certificate shall state that all information required by the subpoena and in the possession, custody, control, or knowledge of the person to whom the demand is directed has been submitted. To the extent that any information is not furnished, the information shall be identified and reasons set forth with particularity regarding the reasons why the information was not furnished. (h) Oral examinations. (1) Procedures. The examination of any person pursuant to a subpoena for oral testimony served under this Section shall be taken before an officer authorized to administer oaths and affirmations by the laws of this State or of the place where the examination is held. The officer before whom the testimony is to be taken shall put the witness on oath or affirmation and shall, personally or by someone acting under the direction of the officer and in the officer's presence, record the testimony of the witness. The testimony shall be taken stenographically and shall be transcribed. When the testimony is fully transcribed, the officer before whom the testimony is taken shall promptly transmit a certified copy of the transcript of the testimony in accordance with the instructions of the Attorney General. This subsection shall not preclude the taking of testimony by any means authorized by, and in a manner consistent with, the Code of Civil Procedure. (2) Persons present. The investigator conducting the examination shall exclude from the place where the examination is held all persons except the person giving the testimony, the attorney for and any other representative of the person giving the testimony, the attorney for the State, any person who may be agreed upon by the attorney for the State and the person giving the testimony, the officer before whom the testimony is to be taken, and any stenographer taking such testimony. 10 county in which the proceeding in which such discovery was obtained is or was last pending. Any petition under this subparagraph (A) must be filed: (i) within 20 days after the date of service of the subpoena, or at any time before the return date specified in the subpoena, whichever date is earlier, or (ii) within such longer period as may be prescribed in writing by the Attorney General. (B) The petition shall specify each ground upon which the petitioner relies in seeking relief under subparagraph (A), and may be based upon any failure of the subpoena to comply with the provisions of this Section or upon any constitutional or other legal right or privilege of such person. During the pendency of the petition in the court, the court may stay, as it deems proper, the running of the time allowed for compliance with the subpoena, in whole or in part, except that the person filing the petition shall comply with any portion of the subpoena not sought to be modified or set aside. (3) Petition to modify or set aside demand for product of discovery. In the case of any subpoena issued under subsection (a) which is an express demand for any product of discovery, the person from whom such discovery was obtained may file, in the circuit court of the county in which the proceeding in which such discovery was obtained is or was last pending, a petition for an order of such court to modify or set aside those portions of the subpoena requiring production of any such product of discovery, subject to the same terms, conditions, and limitations set forth in subparagraph (j)(2) of this Section. (4) Jurisdiction. Whenever any petition is filed in any circuit court under this subsection (j), such court shall have jurisdiction to hear and determine the matter so presented, and to enter such orders as may be required to carry out the provisions of this Section. Any final order so entered shall be subject to appeal in the same manner as appeals of other final orders in civil matters. Any disobedience of any final order entered under this Section by any court shall be punished as a contempt of the court. (k) Disclosure exemption. Any documentary material, answers to written interrogatories, or oral testimony provided under any subpoena issued under subsection (a) shall be exempt from disclosure under the Illinois Administrative Procedure Act [5 ILCS 100/1-1 et seq.]. 740 ILCS 175/7. Procedure Sec. 7. Procedure. The Code of Civil Procedure [735 ILCS 5/1-101 et seq.] shall apply to all proceedings under this Act, except when that Code is inconsistent with this Act. 740 ILCS 175/8. Funds; Grants Sec. 8. Funds; Grants. 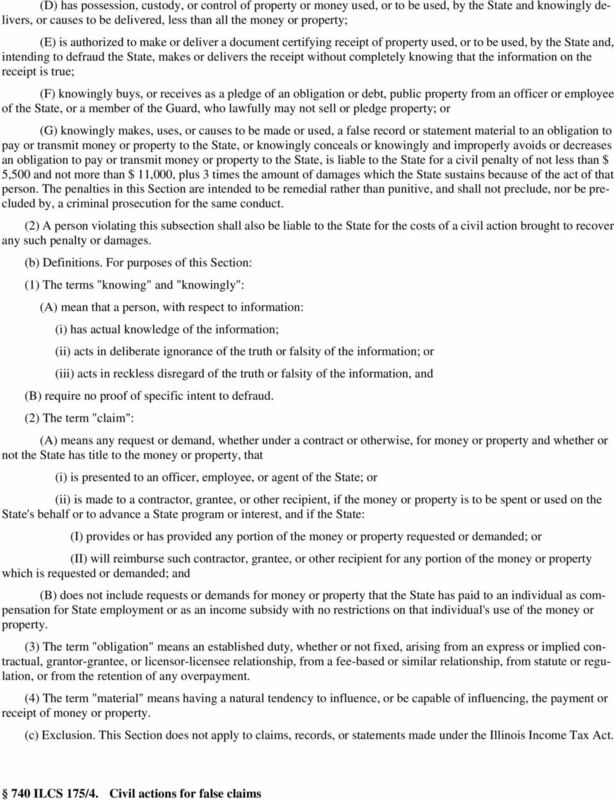 (a) There is hereby created the Whistleblower Reward and Protection Fund as a special fund in the State Treasury. All proceeds of an action or settlement of a claim brought under this Act shall be deposited in the Fund. 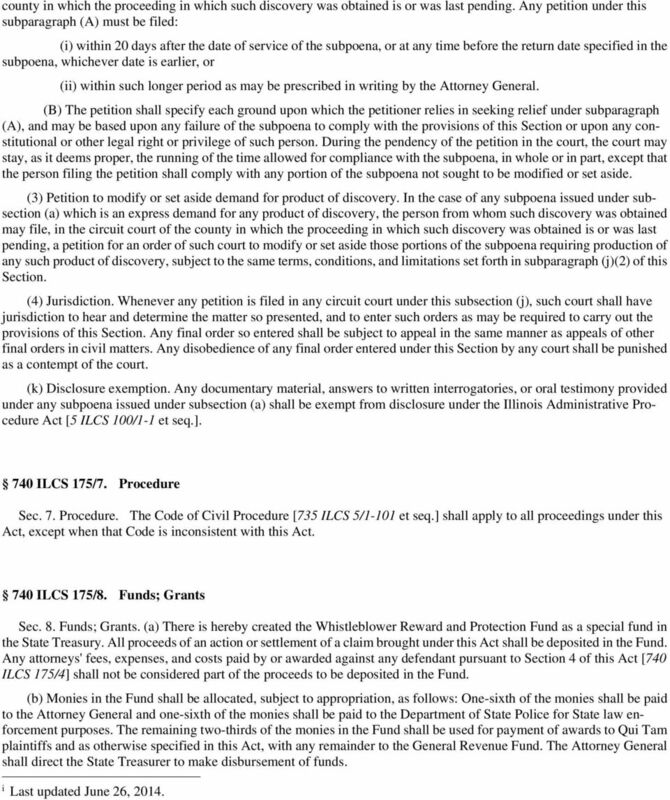 Any attorneys' fees, expenses, and costs paid by or awarded against any defendant pursuant to Section 4 of this Act [740 ILCS 175/4] shall not be considered part of the proceeds to be deposited in the Fund. (b) Monies in the Fund shall be allocated, subject to appropriation, as follows: One-sixth of the monies shall be paid to the Attorney General and one-sixth of the monies shall be paid to the Department of State Police for State law enforcement purposes. The remaining two-thirds of the monies in the Fund shall be used for payment of awards to Qui Tam plaintiffs and as otherwise specified in this Act, with any remainder to the General Revenue Fund. The Attorney General shall direct the State Treasurer to make disbursement of funds. i Last updated June 26, 2014. Accountability Report Card Summary 2013 Tennessee Tennessee has one of the strongest state whistleblower laws: Scoring 75 out of a possible 100; Ranking 3 rd out of 51 (50 states and the District of Columbia).